My schoolmate Simi was a very cheerful and bubbly girl with full of excitement to explore all odds and live life completely with fun and freedom unlimited. She came from a disturbed family. Her father was a famous lawyer with colorful social and political life having no time for his wife and children. Her mother had resorted to kitty parties and social gatherings to stay away from her bad marriage and relations. She learned nothing from her parents about family values. Today when I managed to get her contact number almost after decades I find my friend at a complete loss. From a broken family to a bad marriage, to unhappy relationships she underwent severe depression that made her mentally sick. It was really sad. She is a big example of the consequences of bad parenting. Parenting is a mixed bag. It is exciting yet freaking. It can be fun yet boring. It is amazing yet depressing at times. So as a parent and a mum of three boys I am often confronted with so many hurdles and challenges that makes me wonder how could we ensure proper nurturing for our children and avoid dangerous consequences of bad parenting. My article aims to open eyes to the consequences of bad parenting to create awareness and aid with tools and resources to handle challenges in parenting. I would also discuss the way out to such difficult situations. 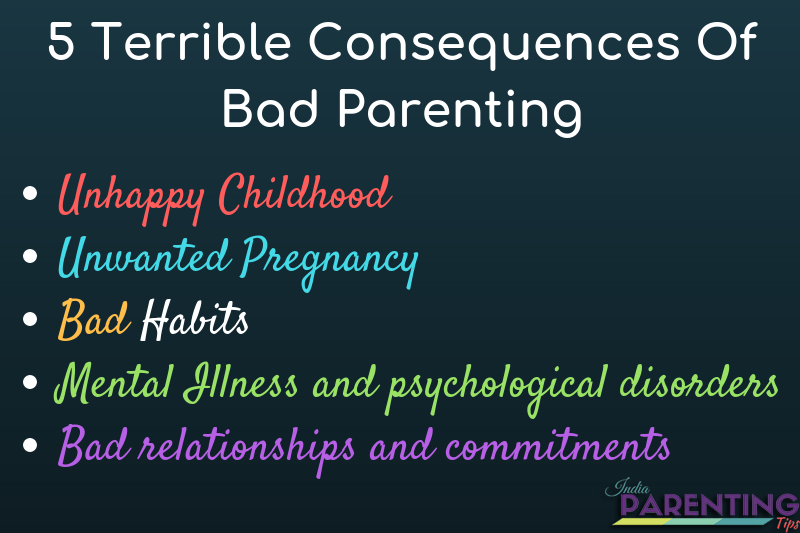 One of the common consequence of bad parenting is an unhappy childhood. Children become an easy target of a bully, attacks and peer pressure. They feel severely depressed and challenged. As a result, they lose self-confidence and avoid social interactions. When children are not happy and secured in their family they tend to easily fall for others without thinking of the consequences. They end up in bad relationships that could either turn out to be a sudden shock with pregnancy or could be other Sexually transmitted diseases. Every human being needs comfort, love, and security. When they do not get the basic needs satisfied by their family, they resort to immediate and short-term happiness like drinking, smoking, having drugs etc. Children born out of bad parenting stay depressed and stressed out. Their constant unhappiness and depression sometimes result in severe psychological disorders and mental illness. Children learn from parents. Knowingly or unknowingly they adapt and accept what they learn from their parents. Often children born out of bad parenting themselves become bad parents and this vicious circle continues. Parenting is a big responsibility that demands honesty and sincerity. Honestly, most of us become parents before we realize its demands and challenges. We learned on the job which is also a good way but it also needs sincere effort and dedication which we often fail to achieve. Not all of us are blessed to have a perfect family. This is a fact and it is okay not to be perfect at times. However, whatever past we had in our lives should not affect us being a parent at present. This means we need to accept ourselves and our life as it is and be grateful to God for giving us what we have now. It is very important to make sure that you get your own space to explore and know yourself completely and be confident about it. Only when you know what you are you can deal with your spouse or your children. Dedicating adequate family time is very essential. You need to ensure you give quality time to your family daily and not dump it on weekend as a separate task. Even 15 -30 minutes quality time to your family is a great booster for good parenting and child development. Communication is a key to any healthy relationship. Be it husband and wife or siblings or parents and children, it provides the oxygen to our life. Honesty is very important. Children learn from our actions and not from our words. If we are honest, sincere and dedicated in our life the same is transmitted to our children effortlessly. This is one great tip to parenting children of today's generation as they are much more aware and advanced than we can think of. No Life is perfect. No one is perfect. However, we can make things perfect in our own way. Parenting is challenging and it is as unique as every child and every parent are unique. You need to know how to deal with your challenges in parenting and avoid bad consequences of parenting to safeguard and protect your child and your family. 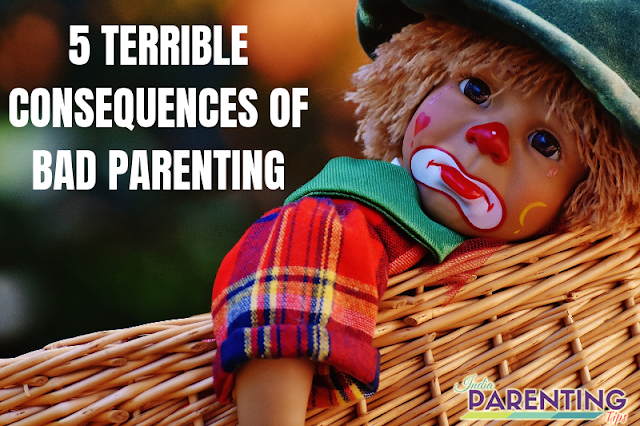 I hope my tips are helpful to understand your role as a parent to address the hurdles and challenges of bad parenting.